On a lovely Monday afternoon, on August 31st, Mr. Christopher Hunter, the Head of School, gave a warm welcome to the students and teachers of the International Studies Program at Ermitage. He then introduced the theme for the orientation week, “Lifelines” and the keynote speaker, Dr. John Cooper Lovejoy, Pediatrician at the American Hospital of Paris. Dr. Lovejoy took students on a unique journey throughout his experience in Niger, where he was the Chief Medical Officer with Médecins Sans Frontières during a six-month mission to combat famine. He fulfilled his dream of supporting the MSF mission after many years of experiences working in Guatemala, in the US inner cities, as well as working with the lowest branch of the Hindu caste system in Nepal. Dr. Lovejoy, in his passionate speech, encouraged students to follow their own path and to stay true to themselves by overcoming barriers that they may face along the way. The student body, comprised of over 130 students, celebrated the arrival of new faces from countries such as Portugal, South Africa, United Arab Emirates, the United States of America, Saudi Arabia, Hong Kong, Mexico, Mongolia, Croatia and more. For the first day of orientation, students mixed across ages and classes to sample a variety of team-building activities including Music, Art, Zumba and Ice-Breakers. With 30% of Foundation and IB students living on campus, the International Studies Back to School Gathering on Monday evening was an opportunity for all families to mingle and build connections for the year to come. Thankfully the rain stayed away for the evening and families enjoyed sitting in the courtyard even once the sun had set. 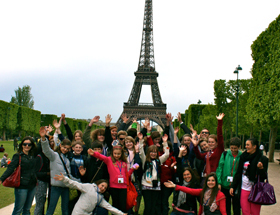 The week continued with a multitude of excursions around Paris and the surrounding areas. Students did a scavenger hunt around Maisons-Laffitte, swung through the trees at a ropes course, prepared a gourmet lunch under the guidance of a professional French chef, had a bird's eye view of all French monuments at France Miniature and visited exhibits at the Musee D'art Modern and the Palais de Tokyo and Galerie de l'Evolution on the theme "Développement Durable: La Planète Aujourd'hui et Demain," just to name a few. Teachers were impressed by the students' preparation for their orientation outings, impeccable behavior and savvy uniform dress for Thursday's first day of class. The International Studies Team is proud to inaugurate the new school year and looks forward to the many memories to come!